Yves Saint Laurent Beaute is always built around glamorous, irresistible packaging, and with their new Yves Saint Laurent Volupte Tint-In-Oil they've also created a clever, winning lip color formula too. 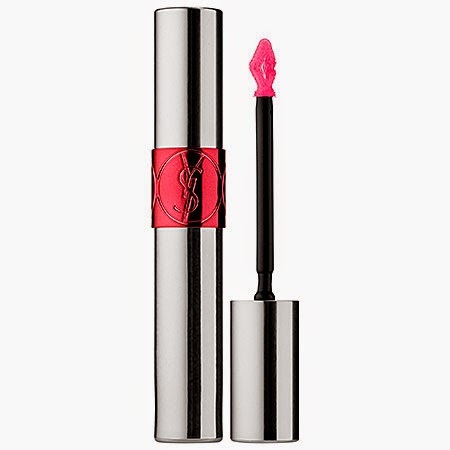 Yves Saint Laurent Volupte Tint-In-Oil is slightly deceptive at first glance - it may look like a high end lip gloss, but it's actually a lip tint with a brilliant, glossy finish. is lightweight and moisturizing, and when it wore down, I was still left with the pretty pink color, which adjusted nicely to my natural lip color, so it looked great even without the high shine. I was impressed that there was very little color transfer on to cups, glasses etc., even though this is glossy. I would say I reapplied only 2x more during the day after my initial application in the morning. The Volupte Tint-In-Oil kept my lips very soft and moisturized during the day, with no flaking.